In the study, Folium Sennae (FS) was firstly extracted by various solvents to obtain five FS extracts. Then, five FS extracts were evaluated for the protective effects against •OH-induced DNA damage, antioxidant abilities in vitro, and chemical contents using various methods. On this basis, the correlation graphs between the pharmacological effects and chemical contents were plotted to obtain the correlation coefficients (R values). Finally, in order to obtain biological evidence, ethyl acetate extract of FS (EAFS) was investigated for the protective effect against •OH-induced MSCs (mesenchymal stem cells) damage using MTT (3-(4,5-dimethylthiazol-2-yl)-2,5-diphenyl) assay. The pharmacological assays indicated that five FS extracts could effectively protect against •OH-induced DNA damage. The correlation analysis suggested that the average R values of total phenolics, total anthraquinones, aloe-emodin, rhein, and emodin were respectively 0.843, 0.833, 0.753, 0.820, and 0.784, while those of total sugars and total saponins were respectively 0.103 and 0.0068. The mechanistic analysis revealed that five FS extracts could also scavenge •OH, •O2–, DPPH• & ABTS•+ radicals, and reduce Cu2+ to Cu+. MTT assay revealed that the viability of MSCs which were treated with •OH radicals has been effectively protected by EAFS (3 and 30 μg/mL). On this basis, it can be concluded that: (i) Folium Sennae exhibits a protective effect against •OH-induced damages to DNA and MSCs; (ii ) The effects may be attributed to phytophenols (especially aloe-emodin, rhein, and emodin), not sugars or saponins; (iii) They exert the protective action via hydrogen atom transfer (HAT) and/or sequential electron proton transfer (SEPT) mechanisms which make phenolic –OH moiety be oxidized to stable semi-quinone form; (iv) The stability of semi-quinone form can ultimately be responsible for the protective or antioxidant effect of phytophenols. It is well known that the DNA oxidative damage by reactive oxygen species (ROS, especially hydroxyl radical •OH) can be repaired via enzymatic or non-enzymatic mechanisms, and that enzymatic repair has been widely explored. Non-enzymatic repair, however, remains relatively unknown until now. Zheng and colleagues pointed out that non-enzymatic repair plays a critic role in basic pharmacology & toxicology, because it is one billion times faster than the enzymatic repair of DNA oxidative damage. The fast non-enzymatic repair is usually exerted by natural phytophenols occurring in medicinal plants (especially Chinese herbal medicines) (Zheng et al. 2010). However, some new questions are also raised. For instance, (i) When a Chinese herbal medicine (medicinal plant) is used for fast repair of the DNA damage, is the repair action of phytophenols implicated with the other components? (ii) How and why do phytophenols exert the repair effect on DNA damage? Since a Chinese herbal medicine Folium Sennae (FS) showed resistance to mutagenic effect caused by DNA oxidative damage (Silva et al. 2008; Demple and Halbrook 1983), we thus used FS as a reference plant to provide the answer to the questions. Folium Sennae (the leaves of Cassia angustifolia Vahi, Additional file 1) was purchased from Caizhilin Pharmacy located in Guangzhou University of Chinese Medicine (Guangzhou, China, Lot No. YPA3A0001), and authenticated by Professor Shuhui Tan. A voucher specimen was deposited in our laboratory. Sprague-Dawley (SD) rats of 4 weeks of age were obtained from the animal centre of Guangzhou University of Chinese Medicine. Trolox (± − 6-hydroxyl-2,5,7,8-tetramethlyhromane-2-carboxylic acid), BHA (butylated hydroxyanisole), DPPH• (1,1-diphenyl-2-picrylhydrazyl radical), pyrogallol, neocuproine (2,9-dimethyl-1,10-phenanthroline) and Folin-Ciocalteu reagent were purchased from Sigma Aldrich Trading Co. (Shanghai, China); ABTS [2,2′-azino-bis(3-ethyl-benzothiazoline-6-sulfonic acid diammonium salt)] and D-2-deoxyribose were obtained from Amresco Co. (Solon, OH, USA); DNA sodium salt (fish sperm) was purchased from Aladdin Chemistry Co. (Shanghai, China); Aloe-emodin, rhein and emodin were purchased from National Institute for the Control of Pharmaceutical and Biological Products (Beijing, China). Methanol and water were of HPLC grade. Dulbecco’s modified Eagle’s medium (DMEM), foetal bovine serum (FBS) and 3-(4,5-dimethylthiazol-2-yl)-2,5-diphenyl (MTT) were purchased from Gibco (Grand Island, NY, USA); CD44 was purchased from Wuhan Boster Co., Ltd. (Wuhan, China). All other chemicals used were of analytical grade. The dried Folium Sennae was ground into coarse powder then extracted in sequence with petroleum ether (60–90), ethyl acetate, absolute ethanol, 95% ethanol and water by Soxhlet extractor for 6 hours (Figure 1). The extracts were filtered using a Büchner funnel and Whatman No. 1 filter paper. Each filtrate was concentrated to dryness under reduced pressure at 60°C using a rotary evaporator. The dried extracts were stored at 4°C for analysis. The preparation of five extracts from Folium Sennae. Where A 0 is the absorbance of the control without sample, and A is the absorbance of the reaction mixture with sample. The experiment of •OH radical-scavenging was conducted in terms of our improved method (Li 2013). In brief, the sample methanol solution (4 mg/mL, 9–36 μL) was separately added into tubes. After evaporating the sample solutions in the tubes to dryness, 400 μL of phosphate buffer (0.2 mol/L, pH 7.4) was added to the sample residue. Subsequently, 50 μL deoxyribose (50 mmol/L), 50 μL H2O2 (50 mmol/L), 50 μL FeCl3 (3.2 mmol/L) and 50 μL Na2EDTA (1 mmol/L) were added. The reaction was initiated by mixing 50 μL ascorbic acid (1.2 mmol/L) and the total volume of the reaction mixture was adjusted to 800 μL with buffer. After incubation at 50°C for 20 min, the reaction was terminated by 500 μL trichloroacetic acid (5 g/100 mL). where, A0 is the A530nm of mixture without sample, and A is the A530nm of the mixture with sample. Here, ΔA 325nm, control is the increase in A325nm of the mixture without the sample and ΔA 325nm, sample is that with the sample; T = 5 min. The experiment temperature was 37°C. Here, A 0 is the absorbance of the mixture without sample, A is the absorbance of the mixture with sample. The total phenolics contents of the five FS extracts were determined using a modified Folin-Ciocalteu colorimetric method (Li et al. 2012b). In brief, 0.1 mL sample methanolic solution (1 mg/mL) was mixed with 0.5 mL Folin-Ciocalteu reagent (0.25 mol/L). The mixture was left standing for 3 min, followed by the addition of Na2CO3 aqueous solution (1.0 mL, 15%, w/v). After standing at room temperature for 30 min, the mixture was centrifuged at 3500 r/min for 3 min. The absorbance of the supernatant was measured at 760 nm (Unico 2100, Shanghai, China). The determinations were performed in triplicate, and the calculations were based on a calibration curve obtained with quercetin. The result was expressed as quercetin equivalents in milligrams per gram of extract. 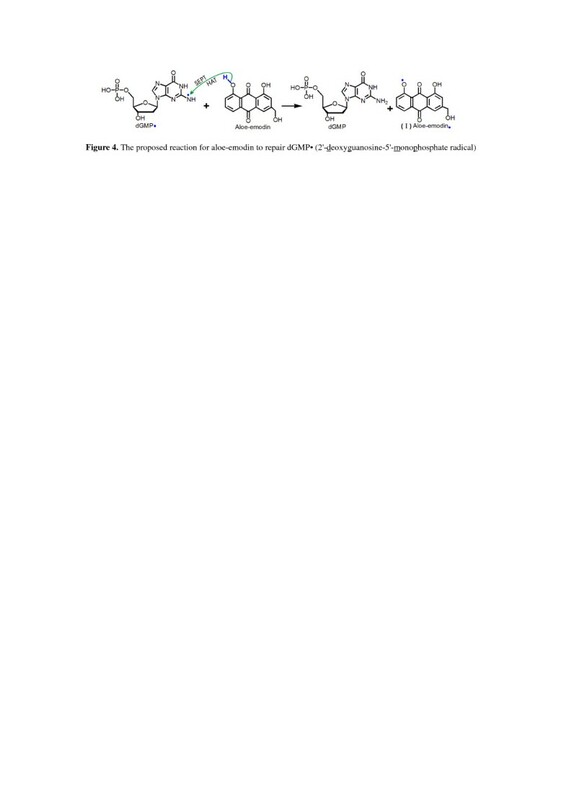 The content of total sugars was evaluated in terms of the phenol-sulfuric acid method (Li et al. 2012c). An aliquot of sample solution (0.2 mL, 1 mg/mL) was placed in a test tube, and the volume was adjusted to 2 mL with distilled water. Then 1 mL of 5% phenol solution and 5 mL of concentrated sulfuric acid were added. After incubation for 20 min at room temperature, the reaction mixture was measured using a spectrophotometer (Unico 2100) at 490 nm. The standard curve was prepared using different concentrations of laminarin and the results were expressed as laminarin in milligrams per gram extract. The content of total saponins was measured according to the method (Li et al. 2012c). Sample methanolic solution (0.15 mL, 2 mg/mL) was taken in a test tube. After the methanol solvent was removed at 80°C, 0.1 mL vanillin-acetic acid solution (5 mg/mL) and 0.4 mL perchloric acid were added to the sample residue. The reaction mixture was incubated at 70°C for 15 min, then cooled immediately and diluted by 1.25 mL acetic acid. After 10 min, the absorbance of the diluted solution was measured at 540 nm (Unico 2100) against a blank control, which contained all reagents except for sample. Quantification was based on the standard curve for oleanolic acid (9.14–54.86 μg/mL). The results were expressed in milligrams of oleanolic acid equivalents per gram of extract. The total anthraquinones content was determined by the colorimetric method (Zhang et al. 2005). In brief, the sample methanol solution (0.4 mL, 4 mg/mL) was separately added into tubes. After the methanol solvent was removed at 70°C, the sample residue was dissolved with 2 mL distilled water, followed by the addition of 1 mL concentrated hydrochloric acid. The reaction mixture was incubated at boiling water for 30 min and shaken continually, then cooled and extracted by diethyl ether (10 mL/time, 3–5 times). After the extract was combined and evaporated to dryness, 6 mL NaOH aqueous solution (5%, w/v) was added and mixed vigorously. After standing at room temperature for 45 min, the reaction mixture was measured using a spectrophotometer (Unico 2100) at 520 nm. The standard curve was prepared using different concentrations of emodin and the results were expressed as emodin in milligrams per gram extract. Aloe-emodin, rhein and emodin in FS extracts were identified by the retention times and the peak areas were used to characterize the relative contents in the study. HPLC analysis was performed on a Syltech P510 system (Los Angeles, California, USA), equipped with a Diamonsil C18 (250 mm × 4.6 mm, 5 μm) column (Dikma Co., Beijing, China). All samples were dissolved in methanol at 10 mg/mL and filtered using 0.45 μm filters. The mobile phase consisted of methanol-0.1% phosphoric acid (85:15, v: v) and the flow rate was 0.5 mL/min, injection volume was 15 μL, detection wavelength was 254 nm. MSCs culture was carried out according to our previous report (Chen et al 2007) with slight modifications. In brief, bone marrow was obtained from the femur and tibia of rat. The marrow samples were diluted with DMEM (LG: low glucose) containing 10% FBS. MSCs were prepared by gradient centrifugation at 900 g for 30 min on 1.073 g/mL Percoll. The prepared cells were detached by treatment with 0.25% trypsin and passaged into cultural flasks at 1 × 104/cm2. MSCs at passage 3 were evaluated for cultured cell homogeneity using detection of CD44 by flow cytometry and were used for the investigation. These MSCs were seeded at 1 × 104 cells per well in 96-well plates. After adherence for 24 hr, these MSCs were then divided into normal, model, and EAFS (sample) groups. Compared with the normal group, MSCs in the model and sample groups were treated with the mixture of FeCl2 (100 μM) followed by H2O2 (50 μM) for 25 minutes, and then which be removed, MSCs of the normal and model groups were both cultured in serum-free DMEM (low glucose) but the sample groups were incubated with EAFS (at 3 and 30 μg/mL) which were diluted by serum-free DMEM (low glucose) for 24 hr. All groups had five independent wells. After incubation, 20 μL MTT (5 mg/mL) was added and then incubated for further 3 h. Culture medium was discarded and was replaced with 150 μL DMSO. Absorbance at 490 nm was measured by a Bio-Kinetics reader (PE-1420; Bio-Kinetics Corporation, Sioux Center, IA, USA). In the experiment, culture with serum medium was used for the control group and each sample test was repeated in five independent wells. All determinations were conducted in triplicate and all the results were calculated as Mean ± SD (SD). The IC50 values were calculated by linear regression analysis. 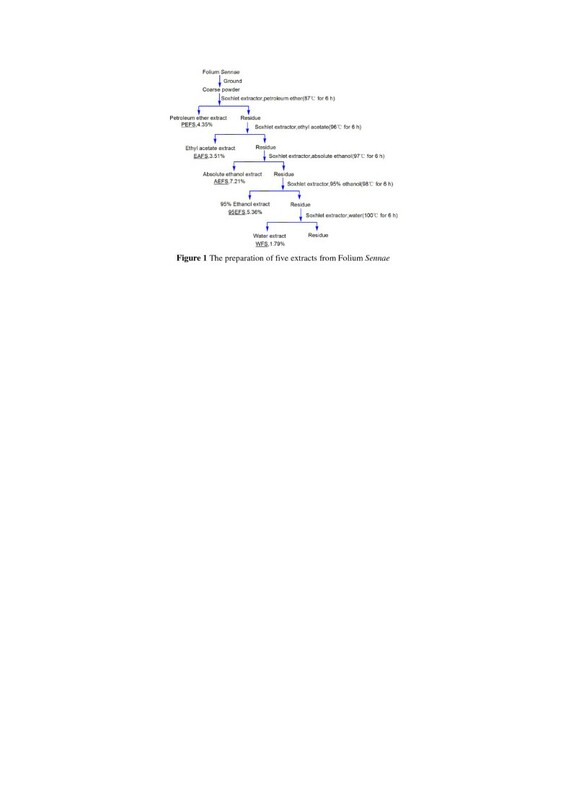 All linear regression in this paper was analyzed by Origin 6.0 professional software (OriginLab Corporation, Northampton, MA, USA). Statistical comparisons between means were performed using one-way analysis of variance (ANOVA). Values of p < 0.05 were considered statistically significant. The analysis was performed using SPSS software 13.0 (SPSS Inc., Chicago, IL) for windows. In the study, FS was firstly extracted by various solvents to prepare five FS extracts, i.e., petroleum ether extract (PEFS), ethyl acetate extract (EAFS), absolute ethanol extract (AEFS), 95% ethanol extract (95EFS), and water extract (WFS) (Figure 1). Five FS extracts were then determined using an in vitro model developed by our laboratory (Li et al. 2013). The results indicated that FS extracts could effectively protect against •OH-induced DNA damage (Additional file 2). In order to identify which chemical component can be responsible for the protective effect, we further measured the chemical contents in the FS extracts, including total phenolics, total sugars, total saponins, total anthraquinones, aloe-emodin, rhein, and emodin (Additional file 2). On this basis, the correlation graphs (Additional file 3) between chemical contents and the protective effect (1/IC50 values, Additional file 2) were plotted to obtain the correlation coefficients (R values). As seen in Table 1, the R values of total phenolics, total sugars and total saponins were respectively 0.769, 0.330, and −0.589. It means that the protective effect of FS may arise from phytophenols, not sugars or saponins. This assumption was further confirmed by the average R values. The average R value of total phenolics was 0.843, while those of total sugars and total saponins were much lower (0.103 and 0.0068 respectively). As we know, phytophenols in FS mainly include phenolic anthraquinones, therefore, total anthraquinones also exhibited a higher R value (0.833, Table 1). Among phenolic anthraquinones, however, aloe-emodin, rhein, and emodin are well-known in FS. In our study, aloe-emodin, rhein, and emodin also possessed higher R values (0.753, 0.820, and 0.784 respectively). Now it is clear that the protective effect against •OH-induced DNA damage of FS can be mainly attributed to phytophenols, especially three phenolic anthraquinones aloe-emodin, rhein, and emodin, not sugars or saponins. Furthermore, non-enzymatic repair by phytophenols has been reported to be via ROS scavenging and direct DNA radical repairing approaches (Zheng et al. 2010). In order to explore the ROS scavenging possibility of FS, we used our methods (Li 2013; Li 2012) to investigate its ROS scavenging abilities, including •OH-scavenging and •O2–-scavenging. Our results showed that five FS extracts could eliminate both •OH and •O2– radicals (Additional file 2). It suggests that ROS scavenging may play a role in fast non-enzymatic repair of FS. To study the ROS scavenging mechanism of FS, we determined its radical-scavenging abilities on DPPH• and ABTS+•. The data in Additional file 2 indicated that FS could effectively inhibit DPPH• and ABTS+• radicals. DPPH• scavenging has been demonstrated to be a hydrogen atom (H•) transfer process (HAT) (Bondet et al. 1997). For example, the proposed reaction for aloe-emodin to scavenge DPPH• can be briefly illustrated in Figure 2. In the process, phenolic –OH underwent homolysis to give H• and aloe-emodin• radical (I). H• was then transferred to DPPH• to generate DPPH-H molecule. Meanwhile, (I) might transform into semi-quinone• radical (II), which could be further extracted H• by excess DPPH• to form the stable semi-quinone (III). The proposed reaction of aloe-emodin with DPPH• (1,1-diphenyl-2-picrylhydrazyl radical). Unlike DPPH• radical, ABTS+• radical cation, however, needs only an electron (e) to neutralize the positive charge and ABTS+• scavenging is regarded as an electron (e) transfer process (Aliaga and Lissi 1998). Therefore, in the reaction of aloe-emodin with ABTS+• radical, aloe-emodin was thought to produce an electron (e) and H+ ion. The electron (e) was then donated to ABTS+• to form stable ABTS molecule. Meanwhile, aloe-emodin changed to the aloe-emodin• radical (I), which could also be converted into semi-quinone• radical (II) and semi-quinone (III) in excess ABTS+• (Additional file 4). The electron (e) transfer mechanism was also supported by the Cu2+-reducing power assay. As we know, reductive reaction is actually an electron (e) - donating process. Five FS extracts, however, could successfully reduced Cu2+ to Cu+ (Additional file 2). Since e transfer is always accompanied by deprotonation, so it is called sequential electron proton transfer (SEPT) (Iuga et al. 2011). To obtain biological evidence, the effect of EAFS which has been regarded as the most effective extract among five FS extracts in the antioxidant assays above, was further estimated using the MTT assay. The results suggested that the viability of MSCs has been effectively protected by EAFS (at 3 and 30 μM, Figure 3) when they were treated with •OH radicals. Based on previous reports (Urbanek et al. 2005; Estrada et al. 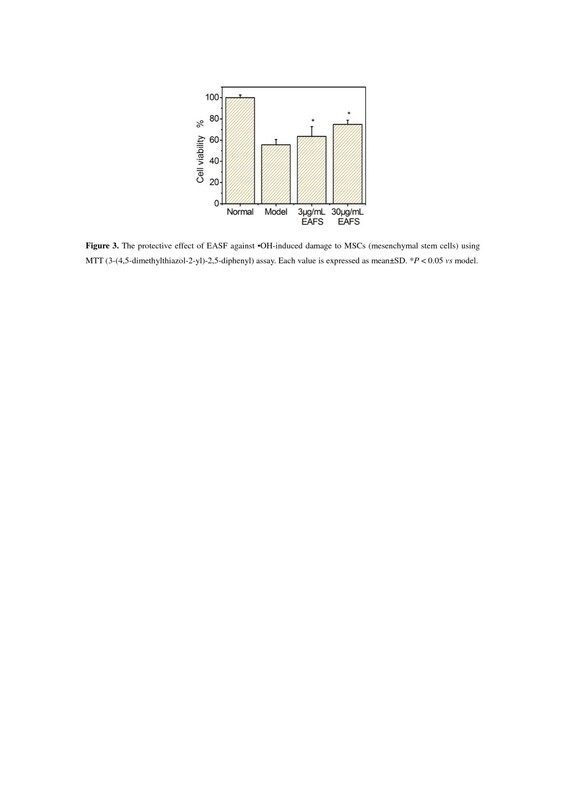 2013), we assumed that the protective effect against •OH radical-induced damage to MSCs might be directly associated with its repair of oxidative DNA damage. The protective effect of EAFS against •OH-induced damage to MSCs (mesenchymal stem cells) using MTT (3-(4,5-dimethylthiazol-2-yl)-2,5-diphenyl) assay. Each value is expressed as mean ± SD, n=3. *P < 0.05 vs model. Taken together, the fact that FS could effectively scavenge both DPPH• and ABTS+• radicals, and reduce Cu2+, implies that phytophenols in FS exert ROS scavenging action via HAT and/or SEPT mechanisms. Both HAT and SEPT mechanisms, however, can similarly make phytophenols be oxidized to semi-quinone (III). As the final oxidized product, semi-quinone (III) is actually a stable form bearing a large π-π conjugation (Figure 2). Hence, the protective or antioxidant effect of FS may be attributed to the phenolic –OH moiety, and ultimately to the stability of semi-quinone form. Of course, the HAT and SEPT mechanisms can be used for the interpretation of ROS scavenging. For example, in water at physiological pH 7.4, aloe-emodin could scavenge •OH radical via SEPT mechanism. As we know, carbonyl groups (C = O) can greatly withdraw electron through π-π conjugative systems to enhance the acidity of phenolic –OH groups in aloe-emodin. In the case, the acidity might therefore predominate over its chemical action in the weak alkaline environment, and phenolic –OH would firstly ionize to yield H+ ion, and aloe-emodin- which subsequently donated an electron (e) to form aloe-emodin• (I) (Additional file 5). However, in the lipidic environment, aloe-emodin scavenged •OH radical via a HAT mechanism: in the case, phenolic –OH in aloe-emodin homolyzed to produce aloe-emodin• radical (I), and a hydrogen atom (H•) which further combined •OH radical to yield H2O molecule (Additional file 6). Actually, both possible mechanisms are supported by the previous report (Iuga et al. 2012). More importantly, both SEPT and HAT mechanisms can also be used for the interpretation of direct repairing on DNA radicals, e.g., 2′-deoxyguanosine-5′-monophosphate radical (dGMP•). The dGMP• may be generated via the reaction of nucleotide and •OH radical (Additional file 7). 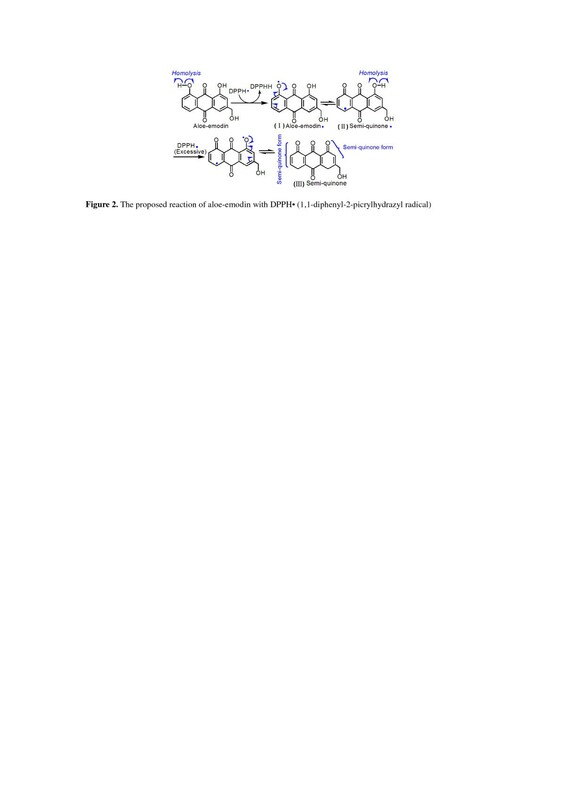 Aloe-emodin, however, could repair dGMP• radical via SEPT and/or HAT mechanisms (Figure 4). As seen in Figure 3, aloe-emodin was oxidized by dGMP• radical to aloe-emodin• radical (I). The proposed reaction for aloe-emodin to repair dGMP• (2′-deoxyguanosine-5′-monophosphate radical). In conclusion, Folium Sennae exhibits a protective effect against •OH-induced damages to DNA and MSCs. The effects may be attributed to phytophenols (especially aloe-emodin, rhein, and emodin), not sugars or saponins. They exert the protective action via hydrogen atom transfer (HAT) and/or sequential electron proton transfer (SEPT) mechanisms which make phenolic –OH moiety be oxidized to stable semi-quinone form. The stability of semi-quinone form can ultimately be responsible for the protective or antioxidant effect of phytophenols. Jian Lin, Xican Li contributed equally to this work. XCL and CDF designed the project and wrote the manuscript, JL, FL, and YB performed the analyses, LH and WBL revised the manuscript. All authors read and approved the final manuscript.